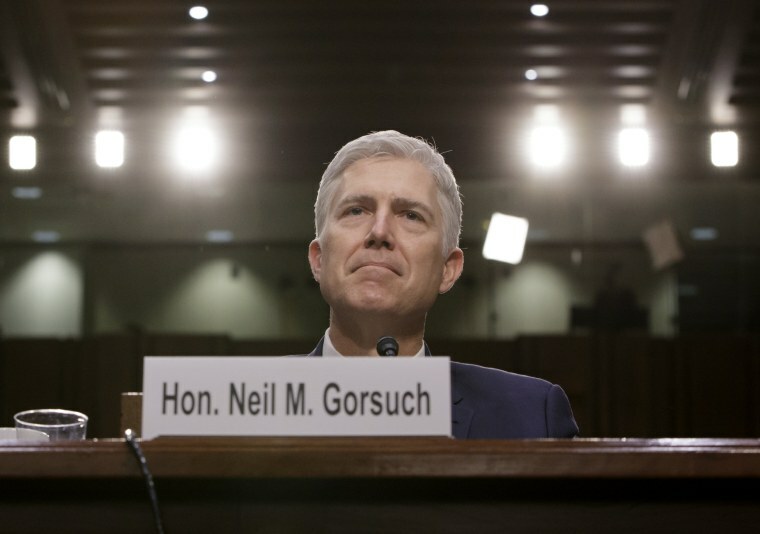 WASHINGTON — As the Senate gears up to consider President Donald Trump's Supreme Court nominee, Neil Gorsuch, Senate Democratic leader Chuck Schumer predicted Sunday that "it looks like Gorsuch will not reach the 60-vote margin" needed to overcome a filibuster. If the 60 votes aren't there, Schumer argued during an appearance on "Meet The Press," Trump should gather with Senate Democrats and Republicans to "try to come up with a mainstream nominee." "Look, when a nominee doesn't get 60 votes, you shouldn't change the rules, you should change the nominee," said Schumer, D-New York. In 2013, then-Majority Leader Harry Reid, D-Nevada, made an unprecedented change in Senate rules to use the "nuclear option" and set a 51-vote threshold for Cabinet appointees and most judicial nominees, rather than 60 votes. Meanwhile, the current Senate majority leader, Mitch McConnell, R-Kentucky, projected that it was possible this week that the Senate could take that one step further and force the rule changes to include Supreme Court nominees. Asked on "Meet The Press" whether he has enough votes to change the rules for a filibuster, McConnell said: "What I can tell you is that Neil Gorsuch will be confirmed this week. How that happens really depends on our Democratic friends. How many of them are willing to oppose cloture on a partisan basis to kill a Supreme Court nominee?" Any senator could object or keep talking to delay a vote — a filibuster. To overcome a filibuster, the Senate needs to scrape together 60 votes for cloture, which allows the Senate to schedule a vote on the nominee. If there aren't 60 votes, McConnell could use the nuclear option, changing Senate rules so only 51 votes would be needed. Three Democratic senators have announced that they would vote for cloture and support Gorsuch: Joe Manchin of West Virginia, Joe Donnelly of Indiana and Heidi Heitkamp of North Dakota. All three are running for re-election next year in states that Trump won by wide margins. But Gorsuch needs eight more Democrats to cross over and vote with Republicans to reach 60 votes. Democrats still harbor frustrations that President Barack Obama's nominee to fill the seat last year, U.S. Appeals Judge Merrick Garland, was never offered a hearing when he was nominated last year after the death of Justice Antonin Scalia. McConnell said he has no regrets about Republican decisions not to hold a hearing or a vote on Garland because the vacancy occurred during an election year, and he declined to answer a question on whether that precedent should be set into a resolution. "That's an absurd question," he said. "We were right in the middle of a presidential election year. Everybody knew that neither side — if the shoe had been on the other foot — would have filled it. But that has nothing to do with what we are voting on this year." Despite any potential rule changes for Supreme Court nominees, McConnell added, "I don't think the legislative filibuster is in danger." That's one issue on whoch the two Senate leaders agreed. "I don't think there's any thirst to change the legislative rules — 60 votes for that," Schumer said. "Most Democrats and most Republicans have served in both the minority and the majority and know what it means."